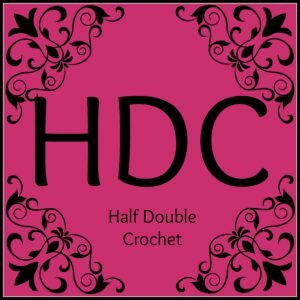 The Half Double Crochet Stitch is abbreviated “hdc” within patterns. When starting out a chain to crochet, you will need two extra stitches in your foundation chain than you plan to have in the row for the half double crochet stitch. So if you plan for your first stitch to be a half double crochet stitch and you want 10 stitches in your row, you are going to chain 12. You will work your first half double crochet stitch into the fourth chain from your hook, skipping the first 2 chains and the next chain after it, because you will be counting the first 2 chains turning chain as your first stitch in the row. Once you have completed a row, you will need to turn your work so that you can work into the tops of the stitches you just completed. If you want your first stitch to be a half double crochet stitch in the next row, you will need to chain two; counting the chains as your turning chain. You need the chains to raise your hook to the proper height before you can complete the half double crochet stitch. You will work your first stitch into the second stitch in the row; skipping the first stitch that the chain two comes out of. Double Crochet Stitch page next!